Data-Driven Web Design and 7 Key Metrics You Should Track You’ve spent months redesigning your website and it’s finally live. While it may be tempting to just launch it and leave it on autopilot and return to your regular marketing routine, the real ROI comes from your ability to make your website work for you over the long term. If your website is the valuable, 24-hour-a-day employee in your marketing organization, you can’t just let it perform on autopilot. 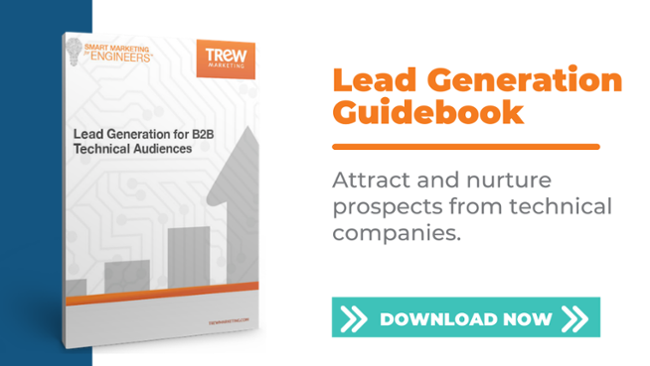 You may be tired of hearing us preach the importance of inbound marketing when it comes to reaching B2B technical audiences. Or maybe you think developing content and maintaining a website is too much work. Whether you doubt the inbound marketing methodology or believe it's too time-consuming to implement, here are some data points that may serve as a catalyst to spark your interest in implementing an inbound marketing approach for your business. A few weeks ago, we covered whether or not to gate your high-value content, including what types of content you should be gating with a form. Gating a content resource involves setting up a landing page with a form that a contact must complete in order to access the resource. We’ve discussed the optimal number of form fields in the past (between 3 and 5 fields), along with the form fields engineers are most likely to complete according to research. Today, we’re going to talk about an oft-overlooked but critical step in publishing gated content: blocking robots from crawling and indexing that gated content piece. What makes some teams pull together, while others totally fall apart? According to Simon Sinek it all comes down to instinctive human behavior. As leaders, we can all learn from this to create environments that draw out the best in our teams. Simply put, brand positioning is the process of getting your target audience to know your brand and associate it with specific characteristics and attributes. One of the first steps to brand positioning is to create a company positioning statement that describes what you do, who you do it for, and what differentiates you from others in the market. In Rebecca Geier’s book, Smart Marketing for Engineers: An Inbound Marketing Guide to Reaching Technical Audiences, she explains how to customize your marketing approach by creating buyer personas. Creating personas is a straightforward process and will allow you to customize your messaging and marketing to your target customers’ specific concerns and needs.